Over a year ago I got my first look, via the web, of a game called Jamaica. The artwork was outstanding and when coupled with the board, the themed rules, and the treasure chest-like box it made for some eye-popping gaming goodness. Unfortunately, the game was a special order given to GameWorks SàRL by ASSURA SA, a Swiss insurance company. From what I understand, the game was to become a gift to some of their special insurance clients. Designed by Sébastien Pauchon, Bruno Cathala & Malcolm Braff, Jamaica followed Pauchon’s success in 2006 with Yspahan and a relatively unknown game named Animalia. ASSURA SA had a hand in Animalia, contracting the game’s production to be used as a promotional tool for their line of pet insurance products. ASSURA SA controlled the entire print run and unfortunately, few have had hands on experience with the game; a shame because the artwork, by Mathieu Leyssenne, is fantastically rendered. Roll forward a year and a half and Asmodée Editions secured the rights to reprint Jamaica for the US market. When I heard the news I started waiting…and waiting…and waiting for someone to list it for sale. It was supposed to be available this month but I have yet to see anyone have any copies. However, last night Pozy.com was listing a few copies for only $37.99 in their “steal of the day” section and I managed to secure one before the “you’re too late” button showed up. So, I’ll be home swabbin’ the deck getting ready to play. On BGG today, the board game Agricola usurped the highest rated game position from Puerto Rico. Puerto Rico has held the esteemed position since 2002 so it’s a big deal. Or is it? I’ve never played Agricola and frankly I have no desire to play it. Tons of cards, tons of bits, two hours + playing time, and people going nuts with Fimo making their own unique “animeeples” sort of creeps me out. I suspect Puerto Rico will rise back to #1 once the Agricola hype settles down. I’m not sure that I care that much either way though. My gaming tastes must have changed somewhat since my copy of Puerto Rico hasn’t seen the table in years and I quite honestly don’t miss it. I started going through the rules of Amyitis last night and frankly, it’s a train wreck. Few games trigger such a visceral reaction while reading the rules but this one wins a prize hands down. I normally research games relatively thoroughly and if possible, I read through the rules online. Unfortunately, I threw the game in with an existing order, on a whim, due to it’s high praise and some good reviews. However, this thing has already made the short list onto the trade pile. The game’s theme, using the term lightly, requires the players (Babylonian nobles) to compete for prestige (victory points) to build plants in the gardens in an attempt to please the king of Medes who is trying to build the Great Hanging Gardens of Babylon for his daughter Amyitis. It seems like an acceptable theme but unfortunately, the mechanics just don’t play it out. First off, the rules are a complete mess. But to give credit where credit is due, they created a game that was difficult to express in written form. The confusing order of presentation and awkward sentence structure doesn’t help comprehension. The components are well made but I do have some concerns about the quality of the cards. They feel rather thin and I suspect the ink will wear rather quickly. My biggest complaint is with the sheer number of ill-named and disconnected items. Making sense of court cards, caravaner tokens, craft cards, gardener cards, talents, resource tokens, irrigation cubes, plants, temples, camels, merchants, peasants, priests, engineers, the Babylonian board, and the Mesopotamia board is a chore. I can deal with a lot of bits but when what you do with them doesn’t work in conjunction with their names and/or function, it turns fun into work. Okay, I lied above. The components aren’t my biggest complaint. It seems that somewhere, at the core of this game, is a real game and they found some flaws with it during playtesting. Rather than reworking the core and simplifying, they threw in some more mechanics. Was there a dominant strategy that triggered the addition of the secondary board. Was the game uninteresting so they threw in the temple “tracks” to spice it up a bit. Regardless, what they’ve ended up with is a complete mishmash of various mechanics, several mini-games if you will that 1) don’t fit the theme, 2) don’t work well together, and 3) are difficult to remember and difficult to understand the relationships. I’m not even going to attempt teaching it to my standard group. There are just too many good games out there that I’d rather play than to slog through the rules amid glazed eyes. It can’t be that fun. I’ve had the print from my 2-player Nile Variant board for Tigris & Euphrates for some time now along with the materials to create and mount it on a quad-fold board. I’ve just been too chicken to actually mount it. Following the guidelines for a non-guttered quad-fold board from the Board Game Design Forum, I cut the chipboard into four rectangles and got down to business. It didn’t turn out quite as well as I’d hoped it would (I can tell it won’t last as long as a “real” board) but I did learn from the experience and feel good that I took a shot at it and, most of all, the materials aren’t setting in the closet mocking me every time I open the door. “Thumbs” are BGG-speak for, well, thumbs. Every time you post a comment, thread, upload an image, file, etc… okay, pretty much any time you touch the site people have the ability to “thumb” content originating from your user id. On your profile page you can see your total thumb count and track back what items have been thumbed and by whom. They’re given for pretty much whatever reason the thumber desired: made-me-laugh, good-image, good-point, I-like-your-answer, bump-this-item-up-so-it-gets-noticed-by-others, etc. The feature has gone through many iterations from allowing thumbs down to only allowing thumbs up, etc. but in the end, I’ve reached a personal milestone of 10,000 thumbs. I’m not the first by any means but it felt good in a strange, geeky, nerdy way and I thought I’d share. On a spur of the moment, Lisa took the kids to her parents house 3.5 hours away for a few days as the last fling in the summer before she goes back to work and the kids get back into school. When she left home I was at work and she sent me an email stating that she was leaving for Indiana and that she and the kids had picked up the house a bit because she figured I’d already be organizing a gaming session while she was gone. We are soooo married. So…to live up to her expectations of me, I hustled around and got Jason and Rich to come over for the evening and play Stone Age and Lexio. The more I play Stone Age the more I like it. Every time I’ve played I’ve tried a different strategy with varying levels of success. You can live or die by the dice but as Jason put it, you’re in control of the level of risk you’re willing to accept. The number of dice you roll is dependent on the number of cavemen you allocate to an area so if you really need to obtain a particular item then you’d darn well better not push your luck. I came out on top tonight which was extra sweet since it was the first official usage of my dice tower (well and it was the first time I’ve won in a long dry spell of humiliating losses :-). I’m convinced that we christened the tower well and my hope is that it will continue to roll well for me and become my own lucky tower of goodness from here on out. We finished up the night with many rounds of Lexio as our wind down game. Thanks for coming guys. You helped me meet my wife’s expectations of me. Well, at least the expectations related to gaming that is. 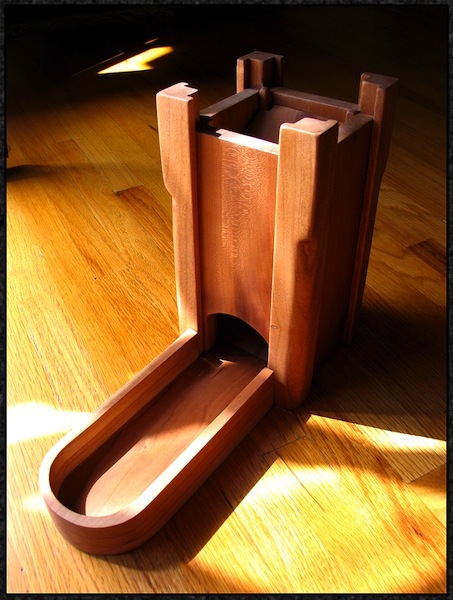 I never thought I’d want, let alone build, my own dice tower. However, my latest craving, Stone Age, is just crying out for one. So, given that I’ve got all the woodworking equipment I need to build furniture (another hobby of mine) and I’ve got several varieties of wood in which to build one, I decided to make my own. Introducing my homemade cherry dice tower. 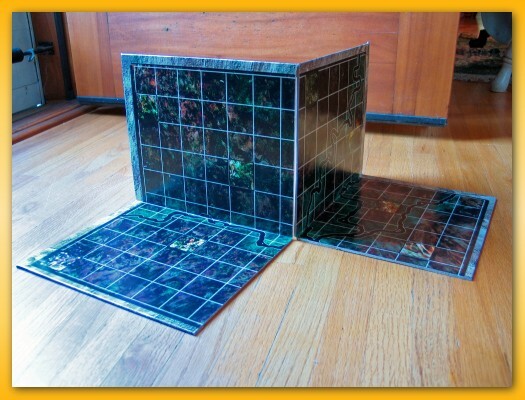 I know the theme of the tower isn’t very Stone Agey but I’ll use it with several of my dice games. I kinda like the chunky medieval castle look. An image submission I made in July is doing pretty well on the monthly image submission contest. If you feel so inclined, give me a thumb and check out the other shots as well. There are several really good ones out there. I’ve exchanged some emails with Aldie at BGG and I’ve gotten the logistics worked out for me to donate some items as give-aways at BGG.Con this year. I’m not going to be there but I thought I’d celebrate vicariously with those that do attend by digging into my own pocket and giving away some freebies from Uberbadger.com. I’ve published a poll at BGG asking for help to narrow down what kinds of products that people would enjoy winning. If you get a chance, I’d appreciate you taking a moment to make the prizes relevant. AGN Aug 2008 was held at my house tonight and with a small group of just Jason, Paul, Keith, and myself, we started off the night with Stone Age. 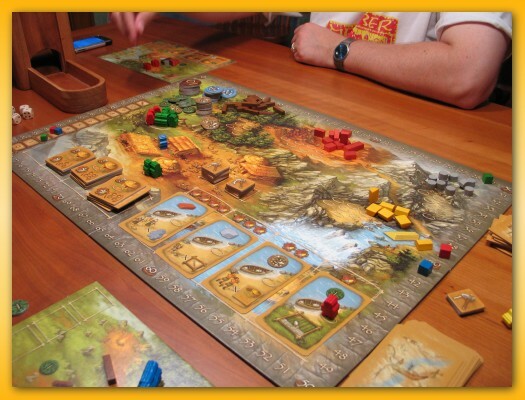 At it’s core Stone Age is a set collection game. No wait. 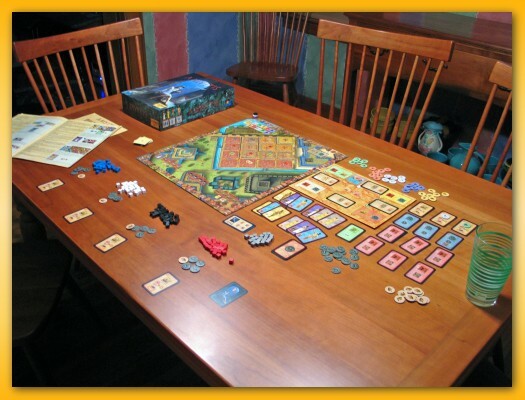 At it’s core, Stone Age is about maximizing resources throughout the game to push your marker down the scoring track. No wait…. 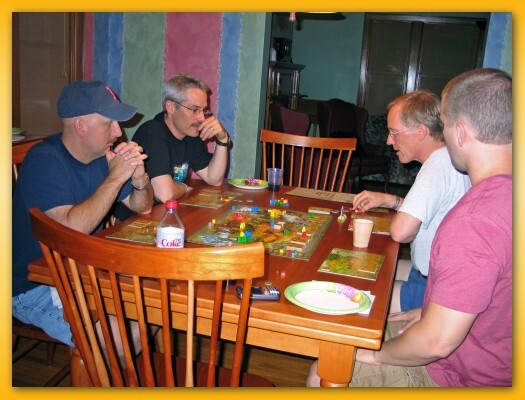 Okay Stone Age present players with multiple paths to victory that include both strategic and tactical moves. Those players collecting cards are taking a more strategic long term approach and will be blessed with points at the end of the game. Those players that horde and burn resources for buildings take a more tactical approach hoping to score enough points during the game. I like the game mostly because it’s fast paced. There is almost zero down time between doing something and each step is pretty straightforward. You can play to block but player interaction is relatively low. Stone Age does punish players that don’t stick with one or two paths to victory. If you switch gears very much in the game you’ll fall behind with no hope of catching up. The leather dice cup is pretty nifty cool but for the most part, the meeples could be yaks; the mechanics don’t reinforce the theme in any readily apparent manner. As they say on BGG, the theme is pasted on. The game does use dice quite a bit and that may sour the milk so to speak for many more cerebral players but I quite enjoyed the randomness. I didn’t find it any more chaotic than say digging for treasure in Thebes for example. Jason plowed ahead with a caveman explosion heading for the hut with a partner almost every chance he could get. By birthing many cavemen and by being lucky at his food rolls (and gold rolls…sheesh!) he could keep them supplied and was able to pay for many nice buildings stretching for the win. I stuck with a green card, tool, and food strategy but in the end came up short. I’m looking forward to many more plays of this game. Since Paul had to make it a short night, we played several hands of Lexio and closed out the evening. I’ve said quite a lot about this game in the past so I won’t go into it yet again. But I do enjoy playing it. Paul said it best when he said, “There’s something inherently satisfying about playing with the big bits”. I’m not sure where he was going with that but I can’t argue with the man. Thanks for coming guys and see you next month or earlier.